Computer Gaming 500 is an ongoing series about my computer gaming experiences totaling 500 titles. Continuing the listing games that received the perfect 10; see intro for more info. You simply can not find a best-of list without at least one Lucas Arts adventure game; in my case I had 4 of them that received a perfect 10. Although they all shared the same SCUMM engine, and in some cases the same writers; they were in their own way, very different. 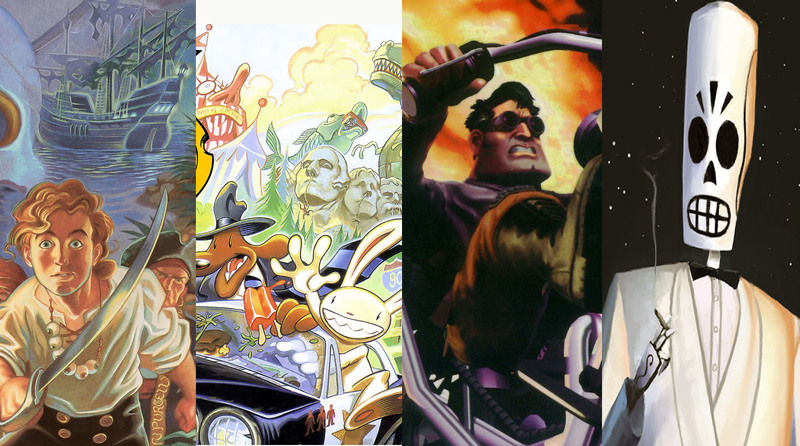 I'll admit, I was a LucasArts junkie! But what wasn't there to like, as they brought interactive storytelling to life with something that we take for granted these days, usability and fantastic original storytelling. In a time where Star Wars was under lock and key; it was nice to find the occasional Star Wars Easter Egg blessed by Lucas himself. So popular they had been, 2 listed below have received recent HD reboots. Although this is far from the first graphical adventure, Monkey Island showed that this genera could be fun, accessible, and overall less frustrating by removing death. It had exactly what people wanted in a game; Pirates, humor, and story. So its a game about a talking dog and a rabbity thing? I'll admit, I had never heard of the comics, but luckily it didn't matter. What a strange universe, yet familiar universe this game is. Touching on every piece of back-road American mythos, LucasArts ditched all seriousness for pure crazy fun. Wholly diversity! In an about face from the laugh out loud tone from SamnMax, Full Throttle tosses you into a apocalyptic universe ripe with corporate corruption, greed and rock n roll. This game showed that LucasArts developers could do something more serious, while still maintaining their core gameplay principles, such as deep story and avoid death by reload. Grim is often cited as the last of the great LA Adventures. This is true, but at least it went out with gloriously. Suiting enough, its about death. Grim bundles everything that had been learned over almost a decade of adventure stories and center it around (suiting enough) around death. A true LucasArts junkie will notice I do not list the Day of the Tentacle, often cited as the best of the bunch. But for me it was a sequel where I had not seen the original, until later using DosBox. So something was lost there. For me, it was the content for an original world that made these games the best. Many fans upset they never got proper sequels, yet, the single game which left the future open to interpretation, is what made them great.